The Odet watershed is a territory of 724 km², representing 2.64% of the size of the Brittany region. The territory presents a density of 174 inhabitants per km², with about 127,000 inhabitants in total in 2014. The watershed is constituted of 27 municipalities. The main city of the watershed is Quimper, the third largest city of Brittany, famous for its cathedral overhanging the Odet coastal river and its half-timbered houses. Half of the inhabitants of the watershed lives in Quimper. Eight watercourses cross the watershed. They all group within the Odet coastal river. In particular, three of the tributaries of the Odet (namely the Steïr, the Frout and the Jet) group within the Quimper boundaries, leading to regular flooding events. Agriculture still represents an important economic activity of the watershed. The Utilized Agricultural Area (UAA) represents about 75% of the total area. The 779 farmers of the watershed (reported in the Agricultural Census of 2010) are mainly orientated towards mixed farming. The density of cows is close to the departmental mean. The largest part of the organic nitrogen comes from cattle. Compared to the rest of the Region, the agriculture is relatively extensive in animals and suffer less from water pollution. Permanent grasslands constitute approximatively the half of the UAA. Among these areas, 3700 Ha are wet grasslands. Taking into account for other kinds of wetlands, there are about 7000 hectares of wetlands in the watershed, i.e. more than 20% of the watershed area. Agricultural wetlands represent 11% of the watershed area. The hydric soil characteristics of agricultural wetlands provide a distinct ecosystem from other land types. Wetlands support the provision of many ecosystem services, principally water purification, flood control and carbon sink. Despite the existence of various international agreements and national policies (notably specific Agri-Environmental Measures), wetlands have been lost or are threatened. These threats are linked to the lack of agricultural profitability of these areas but also to changing legislations. 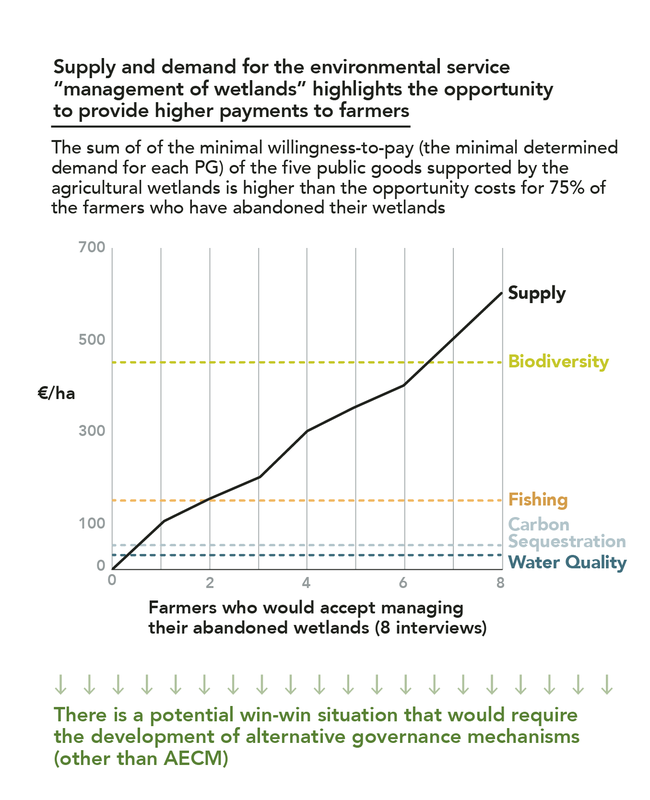 The uncertainties around the legislation frame coupled to the potential high penalties and the opportunity costs has incited some farmers to sell or abandon their wetlands. The proposed payments in the existing Agri-Environmental Measures (AEM) do not provide enough incentive for farmers, especially for high capital-intensive farms. Higher payments would lead to decrease of abandonment. In 2014, stakeholders from Finistère have conducted a census of wetlands to provide detailed information on their evolution. A comparison of the registered agricultural wetlands from 2014 with farmers’ CAP declarations of the same year highlight that 46% of the agricultural wetlands were abandoned. This high abandonment worries local authorities because it conducts to a loss of public good provision. Indeed, expression of ecosystem functionalities depends on the agricultural management of wetlands (Gerakis and Kalburtji, 1998). Extensive agricultural management such as mowing and grazing provide the highest levels of ecosystem functionalities. Based on benefit transfer functions and cost accounting and taking into account for water filtration, flood control, nursery function, carbon sink and biodiversity habitat, the study focusing on the monetary valuation of the environmental service wetlands provide in Odet concludes that the abandonment of wetlands leads to, at least, a decrease of 440€/ha of abandoned wetlands. 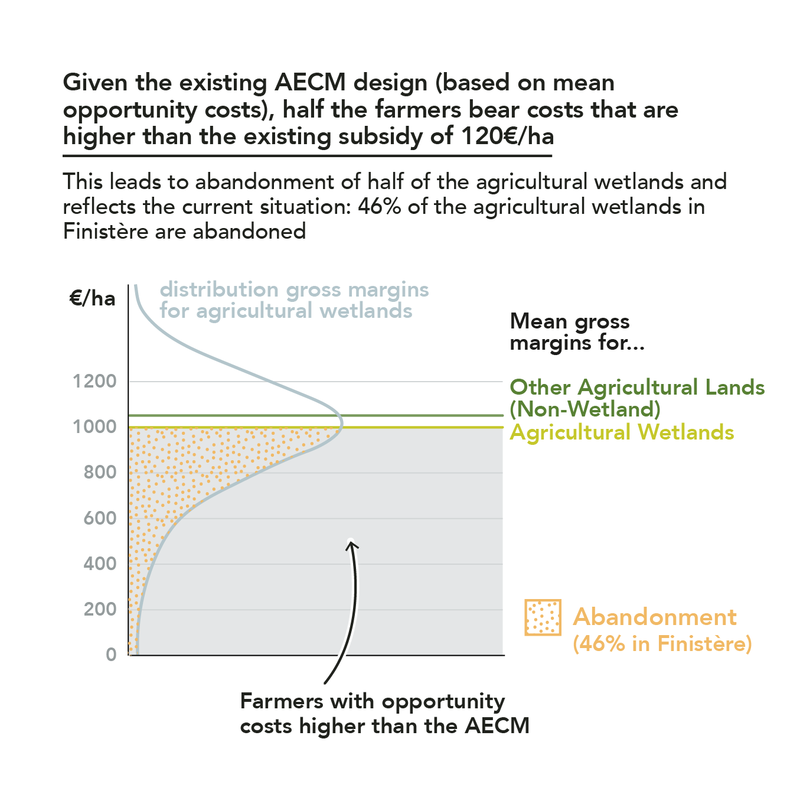 Thus, farmers managing wetlands provide a minimal environmental service of 440€/ha to society (and a maximal value of 1860€/ha). In particular, due to the high demand for local public good, 90% of the environmental service value is captured inside the watershed. Here you find outcomes of the participatory workshops and material in national language.